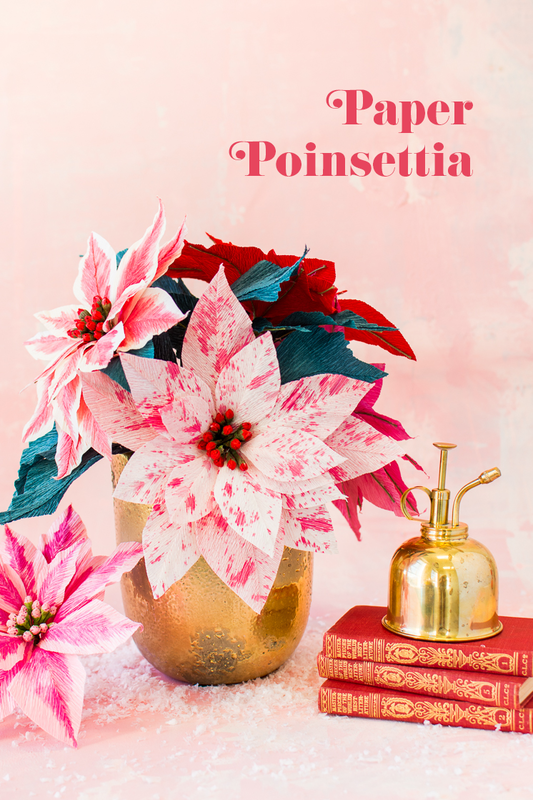 I used to think Poinsettia flowers were one of the lesser flowers on my “favorites list”. I felt like Christmas deserved a much lovelier blossom to represent its magical qualities. That was until I realized that poinsettias were more than just the gold cellophane wrapped arrangements at the grocery store or the tacky silk ones at the craft store. 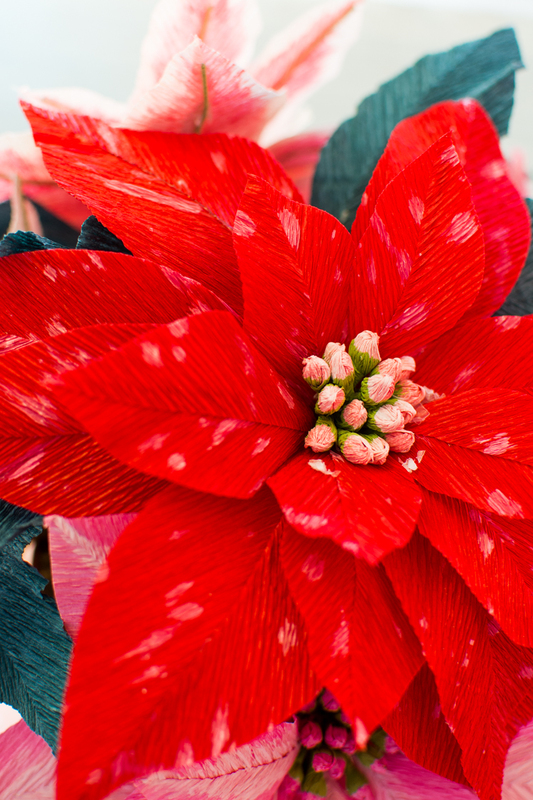 Poinsettias can be found in the most stunning colors and varieties! 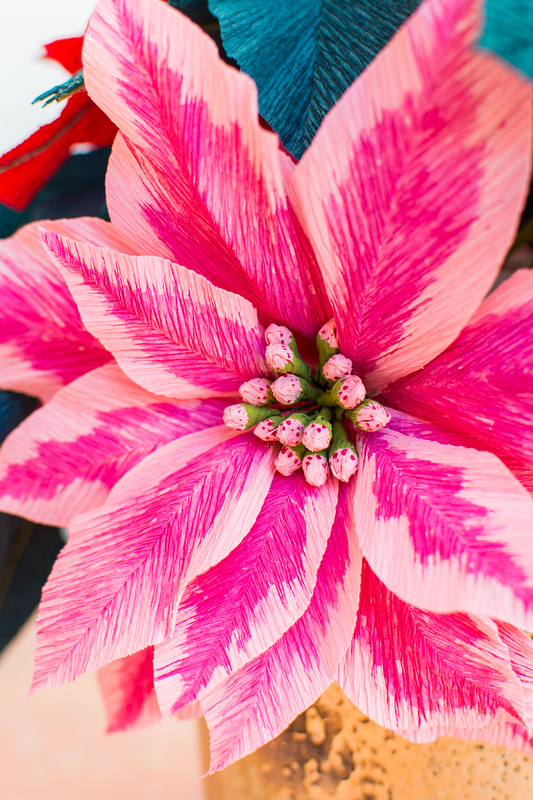 There are speckled versions, bright pink varieties, and much more. After this revelation, I knew it was time to make some Paper Poinsettia Flowers. It’s one that has been requested over and over by readers throughout the years. 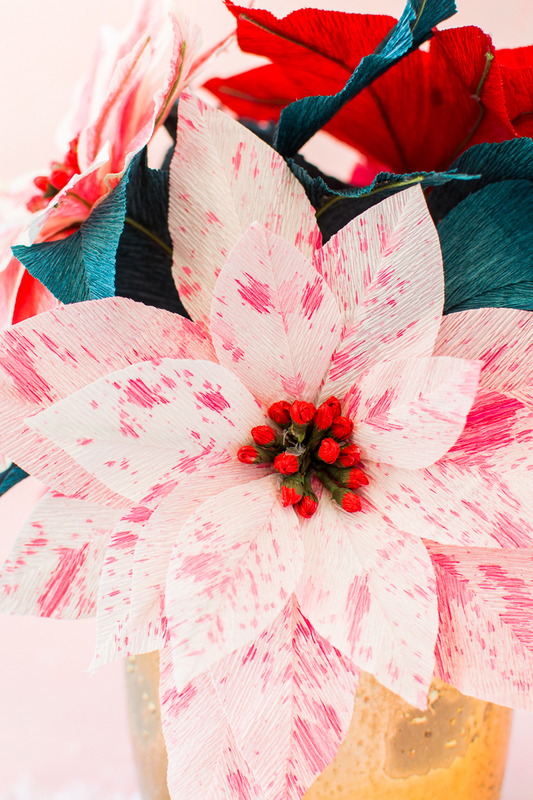 Crepe paper is the perfect medium to add some texture to the petals and have some fun with color. 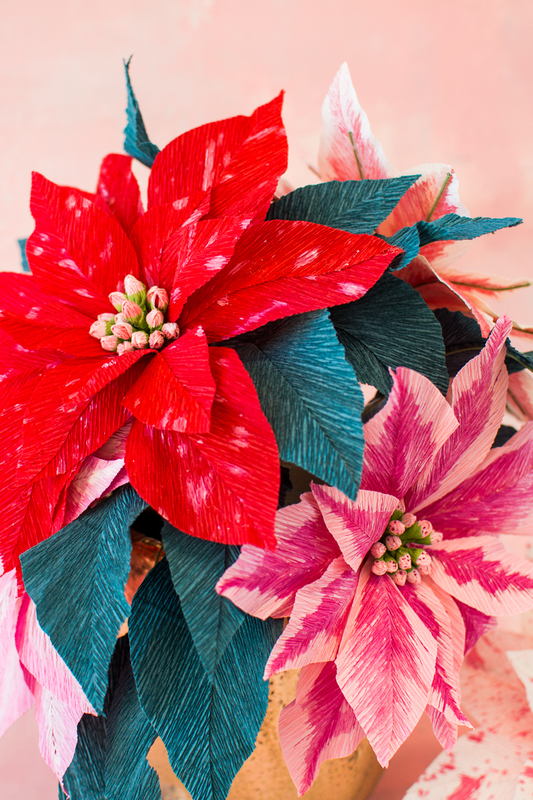 From speckles to brush strokes, these poinsettias will give their real counterparts a run for their money! We teamed up with Cricut so you can easily download the SVG files and your Cricut Maker will cut out all the pieces in no time! Yes, the new Cricut Maker cuts crepe paper! It’s a Christmas Miracle! 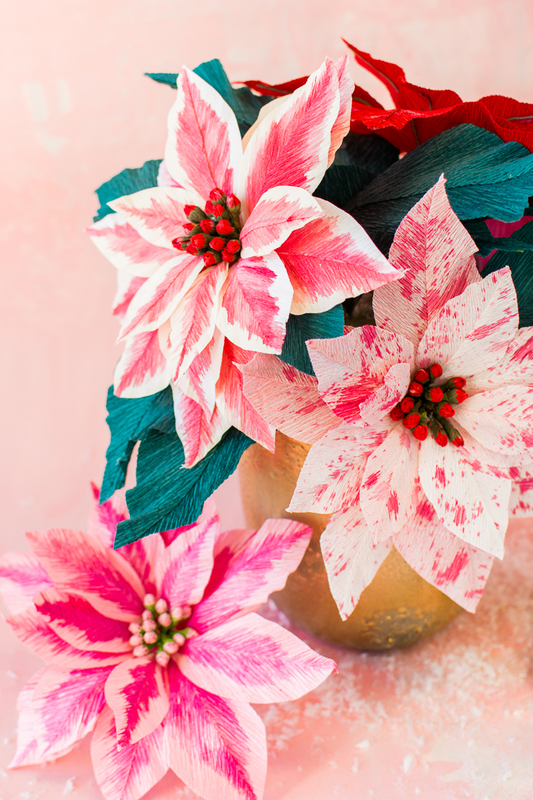 Find out how to make your own paper poinsettia flowers after the jump! 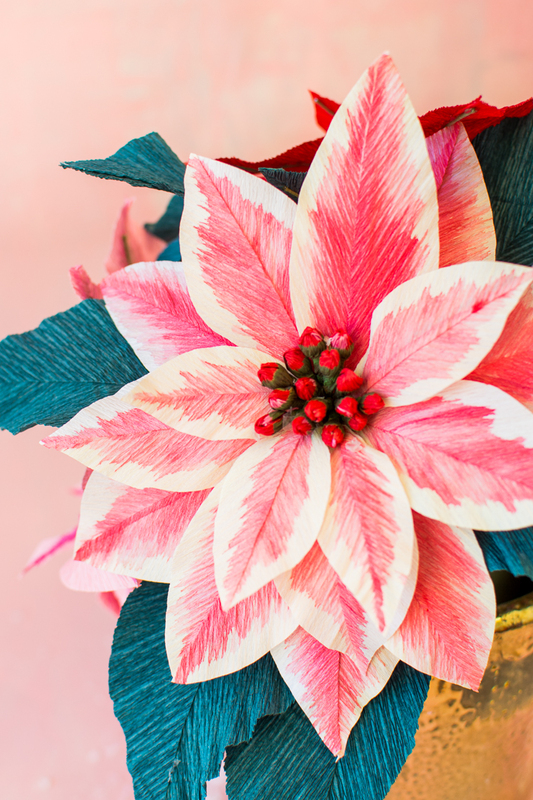 The fun thing about making paper poinsettia flowers is the fact that you can experiment with color and texture! We used a variety of pink, red, and white crepe papers and then added some pattern with acrylic paint. 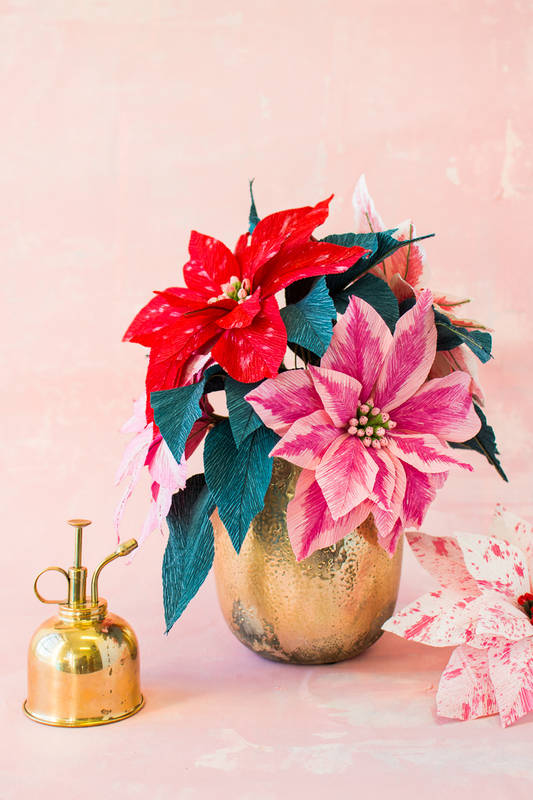 If you lean towards a more classic red poinsettia bouquet, feel free to omit extra paint and go plain! Either way, they are sure to stun your guests. When we found out the new Cricut Maker cut through crepe paper, we knew this would change our lives. But really, it saves so much time! No more hand cutting each individual petal! If you’re struggling to know what to get for Christmas, this is a really good idea. Using the templates provided, cut out the petals and leaves using your Cricut machine, or by hand. We used 4 petals of each size for one poinsettia (16 petals total). Make sure you arrange the paper so the petals and leaves lay perpendicular to the grain. Glue the two sides of the leaf/petal together by overlapping the inner edges slightly and gluing together with a thin line of glue. Make sure the grain of the crepe paper is going up and out from the center for each side of the petal. 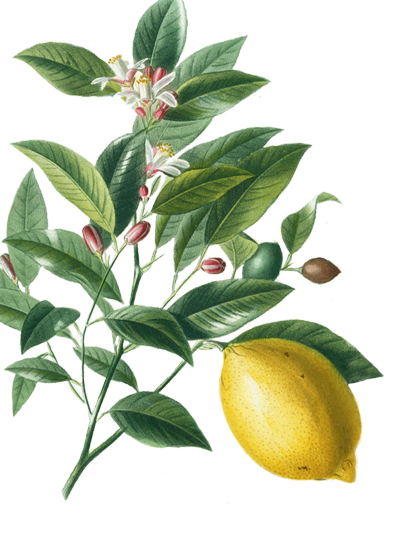 If you’d like to add some texture, water down your acrylic paint slightly and either splatter the leaf or make feather-like brushstrokes down the middle of the petal. For the middle part of the poinsettia cut small pieces of pink/red crepe paper about .5-inch by 1-inch. Twist the piece of crepe paper in the center and mold over the flower stamen and twist. Hold in place with a dot of glue. Repeat for all the flower stamens. We used 16 heads (8 stamens if they’re double-sided like ours). Paint the base of each stamen green and add a few dots to the pink/red part if desired. Bunch all the stamens together in a group and secure them together with floral tape. Add the small petals first to the cluster of stamens, then increase in size as you go. Bend the petals gently to create some shape. 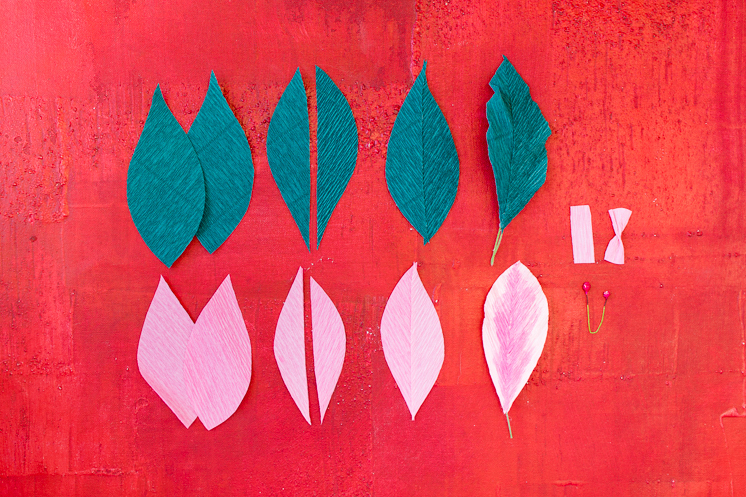 Create a few leaves in the same manner you created the petals. We used 16 leaves for this arrangement. Choose a vase or vessel and fill with florist foam and arrange leaves and poinsettia as desired.